This tough and durable set from DKN includes 2 x 22.5kg (49.6lbs), 2 x 25kg (55.1lbs), 2 x 27.5kg (60.6lbs) and 2 x 30kg (66.1lbs) dumbbells and is suitable for heavy duty strength training and muscle toning. The dumbbells ensure a firm and comfortable grip thanks to chrome plated ergonomically shaped knurled handles and have pinned cast iron rubber encased heads for added safety and long lasting durability. They feature an anti-roll hexagonal design that guarantees protection of flooring and surrounding equipment. for submitting product information about DKN 22.5, 25, 27.5 and 30kg Rubber Hex Dumbbell Set We aim to answer all questions within 2-3 days. 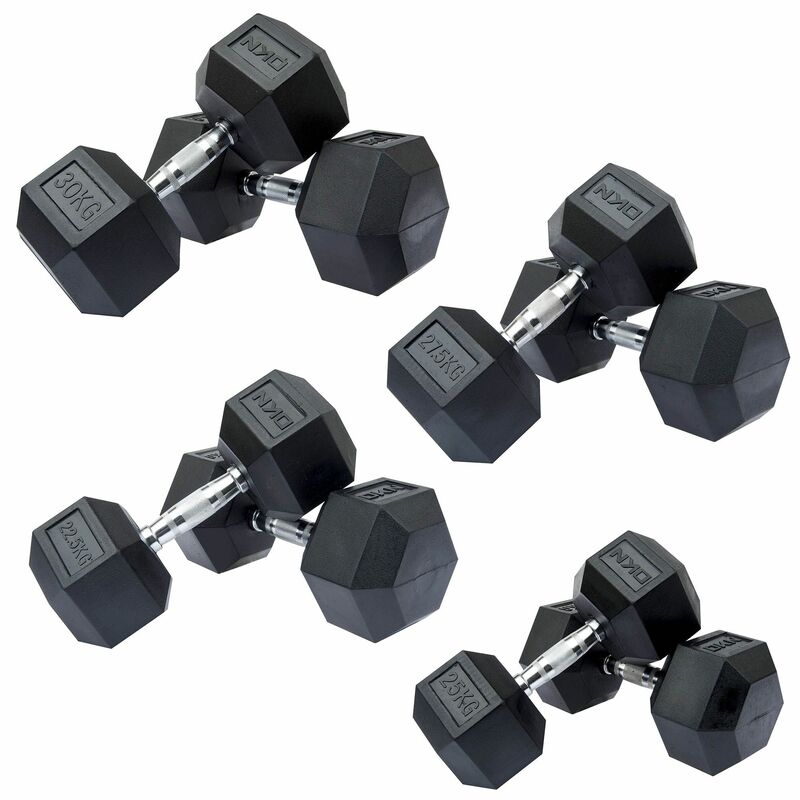 for submitting product information about DKN 22.5, 25, 27.5 and 30kg Rubber Hex Dumbbell Set. We aim to answer all questions within 2-3 days. If you provided your name and email address, we will email you as soon as the answer is published. for submitting product review about DKN 22.5, 25, 27.5 and 30kg Rubber Hex Dumbbell Set.